High Five Events announces the partnership between the 2018 Austin Marathon® and ALVIES. 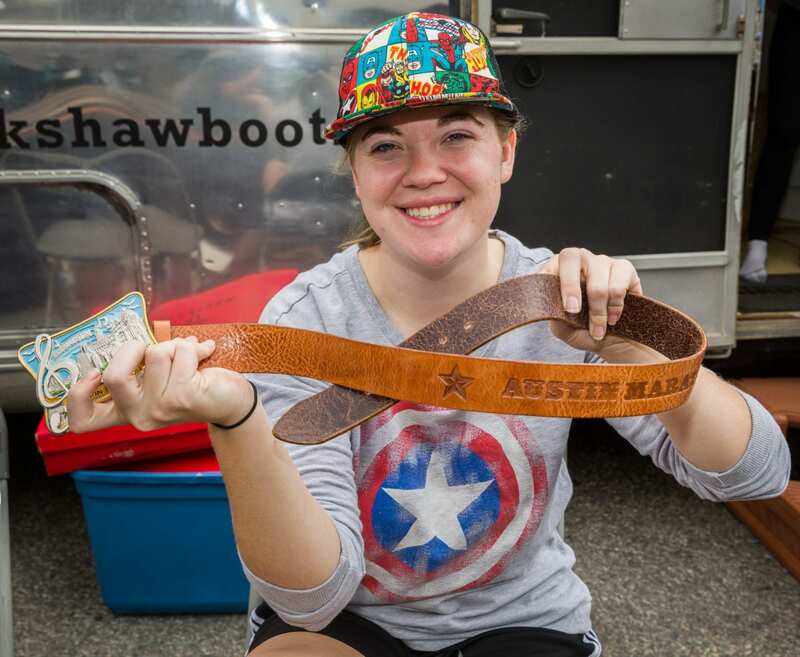 As the Official Belt and Boot, ALVIES will produce the popular Austin Marathon-specific belts for marathon and half marathon finishers; the perfect accompaniment for the Austin Marathon and half marathon belt buckle-inspired finisher medal. ALVIES, an Austin original, brought together a combination that has long been a staple of the Austin culture, boots and flip-flops. In doing so, they’ve created a line of products that relate directly to the culture of Austin. Their belt buckle inspired finisher belts will be available for purchase online before race weekend, at the expo, on race day, and on ALVIES’ post-race. You can visit them at their Airstream at the 2018 Health and Fitness Expo. 2017 Austin Marathon Official Belt. Who doesn’t love happy hour? 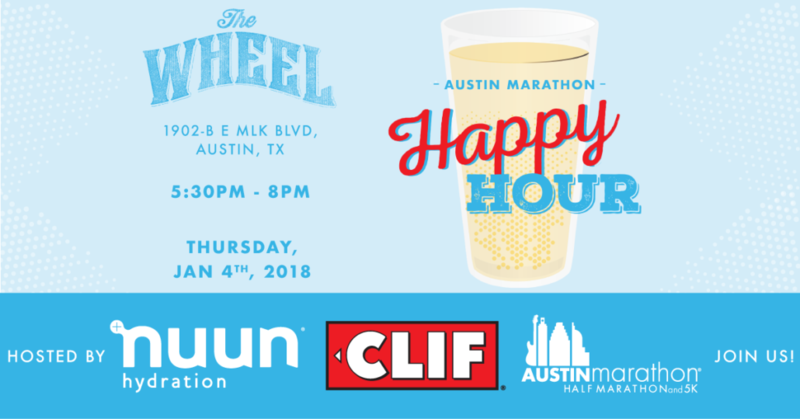 Interrupt your week by joining us at the Austin Marathon Happy Hour at The Wheel on January 4th, brought to you by nuun and Clif Bar. Run with us through the newest parts of the Austin Marathon route and try products that will help your training now while helping you execute your plan on race day. Let’s get together and have a great start to the new year! Kick back, relax, and enjoy happy hour with your fellow Austinites. Friends, great drinks, and a good time isn’t the only thing you’ll get at the Austin Marathon Happy Hour. Walk away with treats and swag from some of your favorite endurance brands! We do happy hour right; don’t miss your chance to win prizes because what would happy hour be without a raffle to top things off? The benefits just keep on coming. The first 50 people through the door will receive a drink ticket and an awesome nuun pint glass! Join us January 4th at The Wheel (1902 E Martin Luther King Jr Blvd.) for some cardio, drinks, and camaraderie with your fellow runners! Don’t miss the run, it starts at 5:30. You absolutely don’t want to miss happy hour, which goes from 6:00 to 8:00. We can’t think of a better way to conclude your exercise than by ending it with a few drinks and great people. RSVP today. Please make plans to have a designated driver. Hope to see y’all there! High Five Events introduces the fifth round of accepted athletes for the 2018 Austin Marathon®. Runners who do not qualify for the Elite Athlete Program are still invited to run in the Elite Field. The Elite Athlete Program’s focus is to provide a clean and competitive environment, discover emerging talent, and help the existing talent pool reach Olympic standards. The Program’s Year Two prize purse totals $20,000, with $15,000 for the marathon and $5,000 for the half marathon. Read about the first, second, third,and fourth rounds of accepted elite runners. Including today, the marathon has accepted a total of 13 runners into the Elite Athlete Program and 17 others have been invited to participate in the Elite Field. The half marathon has accepted 13 runners into the Elite Athlete Program and 16 others have been invited to participate in the Elite Field. Applications are arriving daily and more than 100 have already been submitted. The sixth round of athletes will be announced next week. Applications are still being accepted and elite runners can apply on the Austin Marathon’s website. Athletes that meet the program’s standards and are accepted will be given one comp entry to the 2018 Austin Marathon or half marathon, reimbursement eligibility, and standards bonuses.